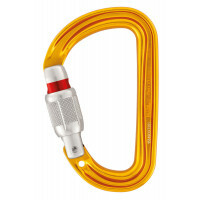 Some Petzl products show 100 kg. Only the EN 341 (descenders), EN 12841 (rope access) and EN 813 (Seat harnesses) standards allow certification for masses over 100 kg. For all other equipment, European standards require testing with a mass of 100 kg. 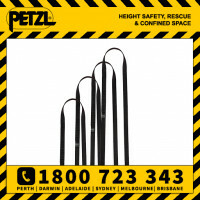 Petzl has carried out a series of tests for masses up to 140 kg and offers three solutions suitable for the forces generated on the equipment and the user. The fall of a 140 kg mass increases the energy on the system by 40 %, compared to that of a 100 kg user. If the equipment is unable to absorb this extra energy, two solutions are possible: use equipment with higher energy absorption capacity, or change the work situation to reduce the potential fall height. 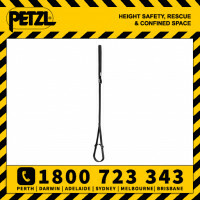 The potential fall height can be reduced by using a shorter lanyard. Use equipment capable of absorbing 40 % more energy. The absorption capacity of the system is sufficient. This is the equipment's ability to hold a suspended mass. 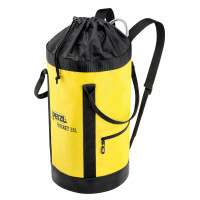 The static breaking strength of PPE certified for fall arrest or positioning is between 10 kN (1000 kg) and 30 kN (3000 kg), depending on the equipment. A weight of 140 kg is then 7-20 times less than the breaking strength of new equipment. This is the equipment's ability to hold and/or absorb a fall. A fall of a 140 kg user with his equipment can exceed the absorption capacity of the shock absorber. The energy produced by a fall is directly proportional to the weight of the subject: E = mgh. A 140 kg user generates 40 % more energy than a 100 kg user for the same fall (5494 J vs. 3920 J). This extra energy can exceed the absorption capacity of the system, the impact force can then exceed 7 kN. Fall arrest means to slow the moving body until it stops completely. E = mgh potential energy. h = fall height in meters. m =mass of the user and his equipment, in kg. g = 9.81 m/s2. Corresponds to the earth's gravitational field (or gravity). Braking can be rapid (sudden impact) or gradual (reduced impact). The absorption capacity of the equipment (dynamic lanyard or shock absorber) increases the braking time to reduce the impact force. With a rigid system, the load on the system very quickly exceeds 15 kN or more, even with short falls of fall factor less than 1. This is the body's capacity to withstand a fall. The braking of a fall can be rapid (short, sudden impact) or gradual (softer impact, longer absorption time). For a given fall speed, the time between the onset of braking and complete stop determines the value of the deceleration, expressed in G.
The European standards are based on studies which set the maximum acceptable deceleration at 6 G for a worker at height. On the basis of a deceleration not exceeding 6 G, the impact force experienced by the user depends on his weight: Sf = md. 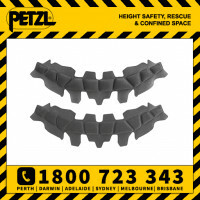 Petzl absorbers are designed to provide 6 G deceleration for the fall of a 100 kg user. The impact force transmitted to the body will not exceed the 6 kN standardized value: Sf = 100 x 6 x 9.8 = 5.9 (6 kN). The same deceleration for a 140 kg user generates a greater impact force: Sf = 140 x 6 x 9.8 = 8.2 (8 kN). It is recognized that the body does not suffer injury as the deceleration is less than or equal to 6 G. Petzl therefore allows that an impact force of up to 8 kN is acceptable for a user of 140 kg (including equipment). Similarly, we can accept an impact force Sf = 120 x 6 x 9.8 = 7.1 (7 kN) for a user of 120 kg (including equipment). In some situations, Petzl accepts that a user over 100 kg can undergo an impact force greater than 6 kN, provided that the maximum deceleration is limited to 6 G.
Evolution of acceptable impact force, as a function of the user's weight, for a maximum deceleration of 6G.